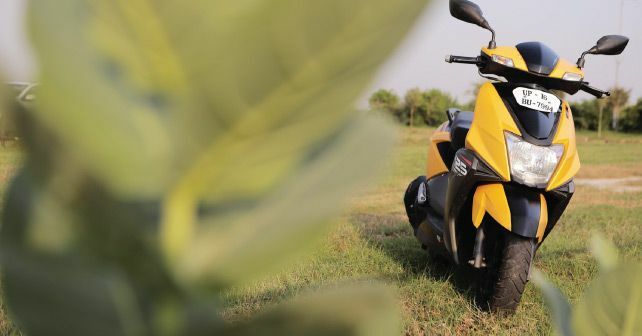 We love riding two-wheelers when winter begins to set in after the festive season, but along with the chill comes the unwanted air pollution, making Delhi one of the most polluted cities in the world. Even this year, the very poor air quality levels made riding a dangerous proposition, but we still managed to soldier on whenever it was possible. The Ntorq is a happy trooper that kept telling me ‘Beam me up Scotty’ every time it’s revved up, or at least that’s my interpretation, going by how agile and responsive the Ntorq is. As much as this 125cc scooter manages to a bring a smile on my face, there were a couple of things that I had to come to terms with. No matter how much you modernise a scooter, it will still have the basic scooter ergonomics, which means it’s not the most comfortable vehicle for long distance commuting. Now, I ride roughly 60 – 80kms every day, and by the end of my commute, my back is sore because of the Ntorq’s riding position. In all fairness, it’s the same for all the scooters. Also, after spending an hour or so on the scooter, you start to sink into the seat, for it lacks support. The Ntorq still remains a hoot to ride in start-stop traffic. What takes the cake is that it ensures that the morning hustle-bustle doesn’t get under my skin, and I’m in a good mood when I start my day in office.